Brucella are alpha-proteobacteria and lie within the order Rhizobiales along with Bartonella and nitrogen fixing bacteria. They cause chronic systemic infections in mammals with relative host specificity: Brucella abortus (cow); Brucella melinentis (goat); Brucella suis (pig); Brucella canis (dog); and Brucella ovis (sheep). Humans develop zoonotic infection after exposure to meat or milk from infected animals from the aforementioned species, within the exception of B. ovis, which is non-pathogenic towards humans. Human infection is characterized by chronic febrile illness which may be complicated by infection of bone (osteomyelitis), joint spaces, and heart valves (endocarditis). Many Brucella are classified as potential biothreat agents. Brucella require a type IV secretion system to successfully infect host cells. On invasion of host cells, Brucella are taken up into a phagosome whose maturation is altered by the activity of its T4SS. The phagosome fails to progress along the normal endocytic pathway and eventually takes on properties of endoplasmic reticulum, and essence becomes part of the exocytic pathway. The cell biology of infection is superficially similar but not identical to Legionella pneumophila infection. The altered phagosome provides a protected intracellular niche where Brucella can replicate. Several translocated effectors contributing to altered phagosome biogenesis have been identified. We recently developed a type IV secretion system-dependent model of Brucella pathogenesis using Brucella neotomae, a species isolated from the desert woodrat. Interestingly we found that Legionella pneumophila could both rescue the intracellular growth of type IV secretion system mutant Brucella and stimulate the intracellular growth of wild type organisms. Brucella pathogenesis is a more recent interest of the laboratory. Bartonella are a phylogenetic relative of Brucella. They similarly causes chronic illness in mammalian hosts. However, Bartonella are found in a much greater diversity of mammals and unlike Brucella are transmitted by blood sucking arthropod vectors. With rare exception, Bartonella species are also dependent on type IV secretion systems for their infectious life cycle. Interestingly, in Bartonella, acquisition of T4SS systems correlates with more benign, nearly commensal relationship with the mammalian host. Bartonella are a focus of the laboratory. C. burnettii causes a debilitating, chronic febrile illness known as "Q fever". The main zoonotic reservoirs for human infection are cattle, sheep and goats. Pneumonic infection may occur in humans located downwind of birthing animals. C. burnettii is a common cause of "culture-negative" heart valve infection in agricultural areas. Virulence of C. burnettii, an organism the replicates intracellularly in human cells, is dependent on its type IV secretion system. Although its T4SS is almost identical to that of Legionella pneumonphila, the translocated effectors and cell biology of infection are different. 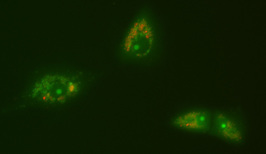 In contrast to Legionella, C. burnettii replicates in an acidified phagosomal compartment. Ricketssia are the cause of spotted fever illness and typhus. They replicate intracellularly in a manner thought to be dependent on their type IV secretion system. Intracellular endothelial infection is prominent component of disease pathogenesis and associated lethality. These organisms cause intracellular infection of neutrophils and monocytes, respectively (human monocytic anaplasmosis and ehrlichiosis). Infection is dependent on type IV secretion systems. One senses a pervading theme in this web page! Interestingly both organisms inhibit apoptosis of their host cells. Neutrophils have a survival half life of only about 8 hours in the bloodstream, so the ability to preserve the viability of the hosts cell that provides their intracellular growth niche is especially important to their life cycle. Several related anaplasmas cause disease in cattle and other ruminants with significant world-wide economic impact. For example, Anaplasma marginale causes bovine anaplasmosis through infection and subsequent destruction of red blood cells. Disease pathogenesis is also putatively type IV secretion system-dependent. Some strains of Helicobacter pylori encode a type IV secretion system that injects the virulence factor, CagA, into host cells. The pro-inflammatory sequelae of CagA injection include gastritis, ulcer formation, and gastric cancer, the human disease manifestations of H. pylori infection.